Australian Christian Book of the Year 2006^^An ideal gift for post-moderns interested in Jesus but not traditional Christianity.^^UNSEEN FOOTPRINTS is more than a book - it's a journey about opening our spiritual eyes to see the activities of the divine around us.^^Could we have had encounters with the divine that we haven't yet recognised as such? Could God be written into the drama of our lives as if played by a secondary character or an extra that we haven't paid much attention to?^^Most of us have days when we sense a world of vivid colour is out there, but remains shrouded from us. Instead of seeing bright reds and purples we see only pastels. But through a brush with serendipity - the unexpected surprise - the veil lifts for a moment and we glimpse the vibrancy of that other world. And in that moment we sense something bigger than us has been encountered. Perhaps someone bigger than us.^^Incorporating classic and contemporary stories, vivid metaphors and compelling graphic design, UNSEEN FOOTPRINTS is a reflective walk through pain, yearning and doubt; a journey that highlights the way God whispers to us through creation, beauty and people; a journey that leads to an encounter with an unseen but present God who shares his dream of a new world and calls us to participate in its creation.^^What if unseen footprints walked before us, behind us, and beside us?^- Publisher. 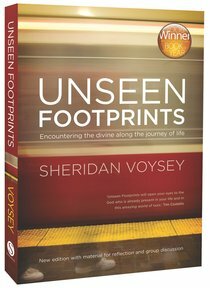 Sheridan Voysey is an Australian-based writer, speaker, and broadcaster. He speaks regularly on issues of spirituality and belief, and has been published in many Australian and international publications.